Contact our friendly sales team on 00353 (0)87 240 6697. & Just €20 Throughout Europe within 28 Days! Size or Colour Not Listed? No Problem! Contact Our Sales Team & We Will Order it in For You! Black Bear is a one piece recurve bow designed to offer quality and performance at an excellent price. 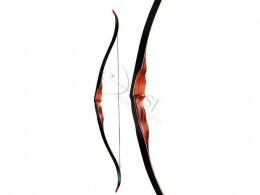 This bow is made with exotic red wood and black fibreglass. Archery Supplies Ireland is the first archery supplies company formed in the Republic of Ireland. With a combined knowledge of over 40 years we will endeavour to provide you with the most suitable archery equipment for your needs. Copyright © 2019 Archery Supplies Ireland Limited. All Rights Reserved.